Product information "Hotpoint SA2540HBL Black Single Oven"
Cook your food faster, and to perfection with the Hotpoint Class 4 SI4 854 P IX Electric Oven. It has Multiflow technology that spreads heat flow into every inch of the oven cavity. There are no cool spots, which means food gets cooked to perfection no mattter where it is in the oven. The result is delicious dishes each time. It's perfect for baking cakes, bread, and all your favourite recipes. Diamond clean utilises the power of steam to make cleaning your oven easy. The special enamelled cavity has easy clean properties, and uses a dedicated low temperature cycle of 90° for only 30 minutes. Multifunction cooking uses a fan to circulate hot air around the cavity to thoroughly cook through your food, distributing the heat evenly. It allows you to cook various food types together, as there is no flavour transfer - perfect for cooking a roast dinner for the family. With this Hotpoint Class 2SA2540HBL Electric Oven, the five pre-set programs take all the guess work out of cooking. Simply choose the setting that suits what you want to cook. The full-width tilting grill offers safety and control over your cooking. You'll be able to unhook and tilt the grill to be able to easily clean the top of the oven. Jamie Oliver and Hotpoint have joined forces to bring you cooking appliances that let you express yourself in the kitchen. Create the kind of dishes you love, for everyday meals or to entertain friends and family. Eat better and get more out of your food with Hotpoint's user-friendly appliances. ELECTRICAL INSTALLATION: This product can be plugged into a standard 13 Amp socket. 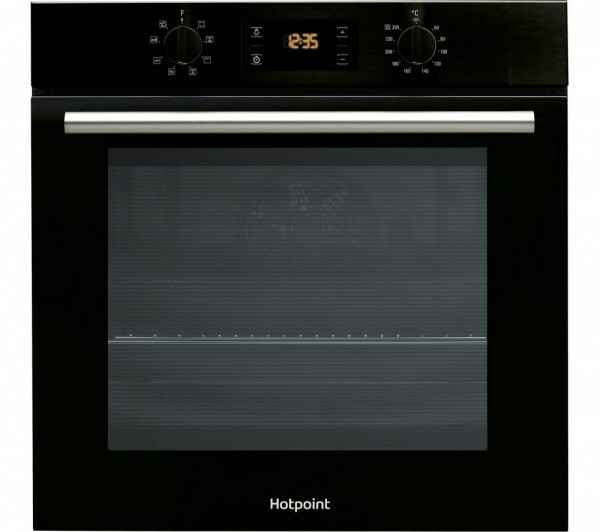 Related links to "Hotpoint SA2540HBL Black Single Oven"
Customer review for "Hotpoint SA2540HBL Black Single Oven"